After six month long murder investigation, Saluda County investigators along with SLED have made an arrest in the murder of a Saluda County woman. Back in June of this year it was reported that Nancy Caughman Lott was missing. It was not until two months later that her remains were recovered in the Edgefield County landfill. Investigators along with deputies have worked tirelessly trying to get some sort of solid lead into the case. Friday, December 16, 2016, a warrant was issued and served on Kincaid Bobby Mitchell, age 46, of Ridge Spring. 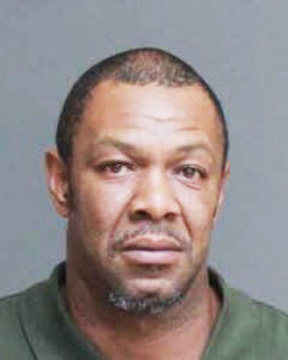 He is charged with the murder of Ms. Lott and in connection with her disappearance. that he would like to thank Saluda County Coroner’s Office along with Edgefield Sheriff’s Office and SLED for being of great assistance in this case. SHERIFF’S OFFICE DONATION - Thank you so much to our wonderful Saluda County Sheriff’s Office for their generous donations to help out our Hollywood community. 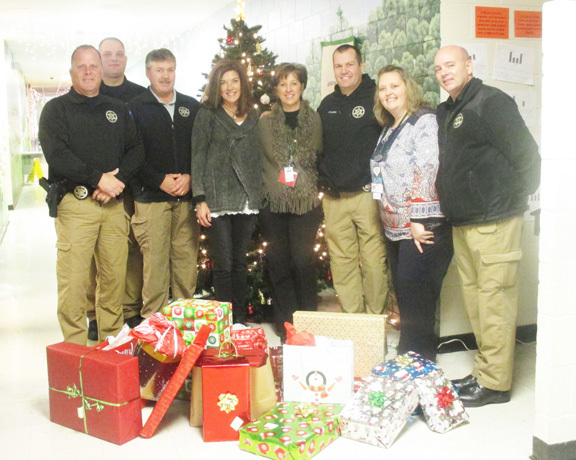 Sheriff John Perry and several members of his staff delivered gifts to HES on Monday, December 12. Thanks to their donations several families will be blessed by their kindness this holiday season. The Ridge Spring Christmas Tour of Homes will be held on Sun., Dec. 11, from 2-5 p.m. The homes are: Jack and Sarah Schwarz (171 Joes Trail, Monetta), Dean and Amy Derrick (217 Burton Drive, Monetta), and Rudy & Diane Stoddard (2698 Hwy. 23, Ridge Spring). Also on the tour are Ridge Spring Baptist Church (108 Cjhurch Circle, Main Street), and primitive Immanuel Lutheran Church (206 Boatwright Street). Cake and spiced cider will be served at Ridge Spring Baptist Church Fellowshio Hall. Tickets are $10 and may be puchased at all homes and the Baptist church. Thei occasion is sponsored by the Green Thumb Garden Club and assisted by the Ridge Garden Club. As the story goes a much older house, across the road here in Monetta, is where the Burtons lived before this house was built, around 1904. One of the Sr Burtons was reluctant to leave the older home, but when supper -time came, he relented and came to the new home to eat on Burton. The house was built with the trees on the property. The house has had very little structural change over the years. A back porch was enclosed to become part of the living area. The house was wrapped in vinyl siding in the 80’s and the original wooden window shutters were taken down. Somewhere back in the 1970’s .loe and Pat Burton inherited his home and brought up two daughters. They did some interior work. When they decided to sell, no one in the Burton family would buy the house so it was sold outside of the family. This location and the surrounding area was deeded to Nathanial Burton by the King of England well over 200 years ago. Also, across the road is the Burton family cemetery along with faint evidences of a slave cemetery that is further in the pines. The Dean Derricks purchased the House in 1998 and brought their four boys to live and enjoy this wonderful place. This home has been full of family and friends enjoying life together for the past 18 years!! lt warms our heart that we have been blessed with this home!! Beneath the stucco exterior of this simple Plantation Style home lay the bricks which through the years have given it the name “Brick House Jones“. These bricks once made up the basement of an elegant 3-story West Indian country house with about 18 rooms at this location. This spectacular and very richly fmnished plantation home was owned by James Bolivar Jones at the time it tragically burned in 1892. The present house built by James B. with the brick of the old house was originally a Pennsylvania Farm House type, with red brick, a wide first and second floor porch and white trim. Later the bricks were covered with stucco to protect them as they aged. Originally there was a rear wing of tive rooms and a cellar which were torn away. Family members remember a farm bell which could be rung iiom the kitchen doorway. James Bolivar Jones, whose house burned was the grandson of pioneer settlers of Ridge Spring, Col. Matthias Jones and his wife Clara Perry Jones. James B. was bequeathed his grandparents elegant home (as described above) by his Aunt Elizabeth Jones Watson. His Grandfather, Col. Matthias Jones, a large scale planter and merchant, had nearly 2000 acres of land at Ridge Spring. The house was occupied for many years by the late Imants A. Ceips, Sr., M.D. and his wife, Sigrid. To accommodate their 5 children, they enclosed the back porch to make a hallway and added Z bedrooms and a bathroom. They also added closets and a bathroom upstairs. 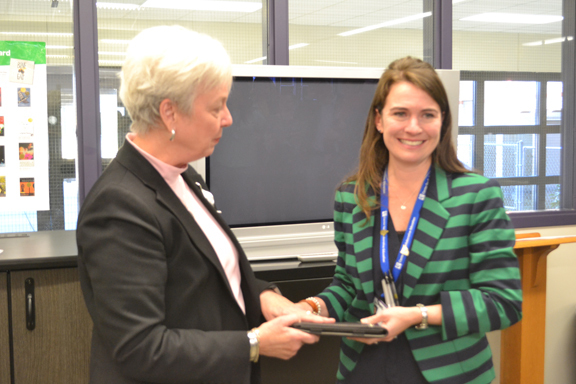 Dr. Ceips’ office is located in the side yard. Since the Stoddards purchased the house in 1986 they have added a laundry room and a low country bank porch. The house contains many pieces of itiimiture and other items which were in Mr. Stoddard’s family. White Oaks, home of Mr. and Mrs. Jack Schwarz of Monetta, was built in the early 1840’s by John D. Watson. The house was home to generations of Watsons, including John’s grandson, Dr. W.G. Watson of Augusta, the obstetrician who delivered Sarah and her two daughters, Nancy and Emily. The home has been known as the Cora Watson House to all in the surrounding community. Cora was the daughter of John D. Watson, and spent her whole like there since she never married. In 1996, the Schwarz purchased the home from a descendant of the Watson family. The house was then moved to the north east side of Monetta. 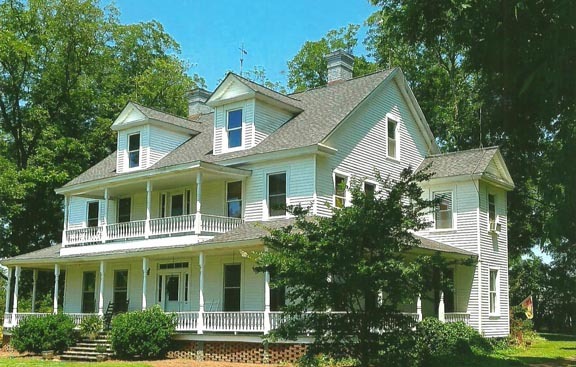 It now resides on 128 acres of farm land and pasture and overlooks at stocked pond. Upon arrival at its new location, the home was “reversed” so that the grand front porch could overlook the pond and was screened for enjoyment during any season. The rear of the house was redesigned to compliment the original front, for the look of a traditional southern farmhouse. As you enter the home, you will notice the large cut of the heart-of-pine planks used in construction. All lumber was original and some remilled for use in the reconstruction. Doorways were not moved, just widened to allow easier movement while entertaining in the home. The basic layout of the home is still a main four-room structure with center hall and wing rooms, topped by two large upstairs rooms. All downstairs room open unto the wrap around back porch. Yon Family Farms has purchased the Watson Farms Orchard and the Nut House in Ridge Spring, upon the retirement of the 93-year-old owner, Joe Cal Watson. 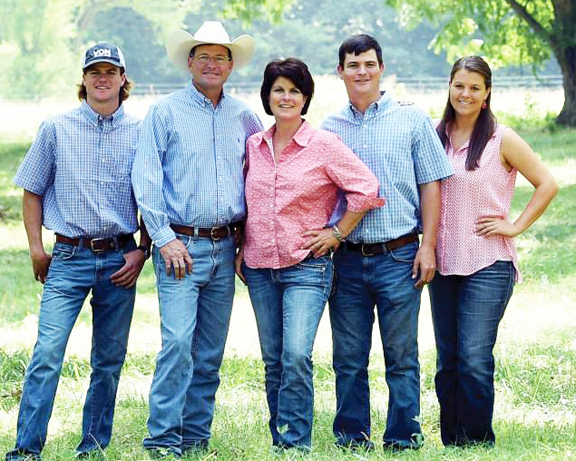 Yon Family Farms is a family owned business that began in 1996 when the family moved to Ridge Spring with 100 cows and three children under the age of five. All three are now Clemson agriculture graduates and have returned to the Ridge to the family business. The young adult children have really taken the reins of the pecan harvest, marketing, and running of the Nut House. In 1926 on eight acres of land. Mr. Watson’s father planted a pecan orchard. Mr. Watson remembers watching dynamite create holes in the stiff clay soil to plant the trees. Mr. Watson grew up working with these trees until he graduated from high school and continued on to Clemson College. 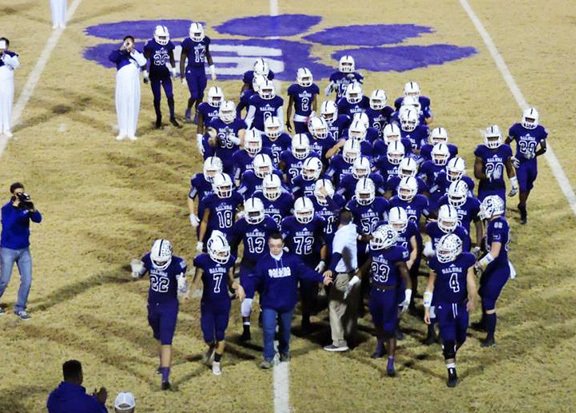 Mr. Watson attended Clemson College for three years before serving in the army during and after World War II. During Mr. Watson’s service, he spent time in The Battle of The Bulge, Belgium, Luxembourg, France, and Germany. Mr. Watson returned to Ridge Spring in 1950 and continued to work in the pecan orchards. As technology evolved and equipment was more readily available, Mr. Watson had outgrown his small orchard. He was able to purchase 80 acres of land and leased additional space in a peach orchard. With so many trees, Mr. Watson opened a harvesting and cleaning plant, which then in 1997 evolved to include the kitchen and retail space that was named The Nut House. The Nut House and Country Market is located on Main Street in Ridge Spring. In addition to tasty pecans, pecan pies, and homemade candies, you can also purchase locally grown Yon Angus Beef, Hickory Hill Milk, and Clemson Blue Cheese! 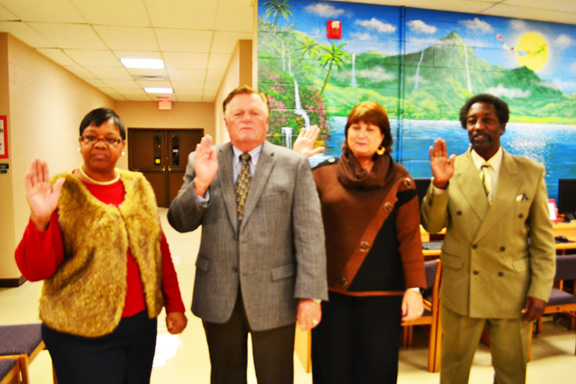 BOARD MEMBERS SWORN IN - Judge Bruce Horne issued the Oath of Office to 3 re-elected Board Members- James Holloway, Dr. Arlene Puryear, and Sharon Holloway along with newly elected Board Member, Bill Eberz. 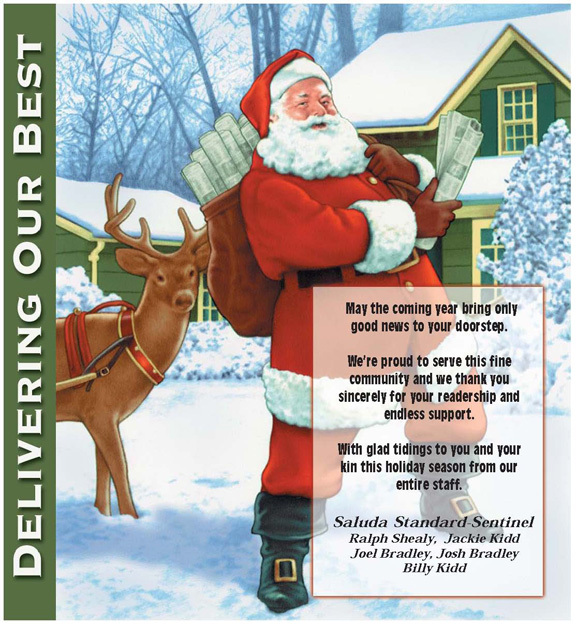 The Saluda County Chamber of Commerce is excited to celebrate the end of a great year with special events. The Christmas Parade and The Polar Express Movie Night will be on Sat. Dec. 17th. We are expecting a wonderful crowd for this special evening of activities. 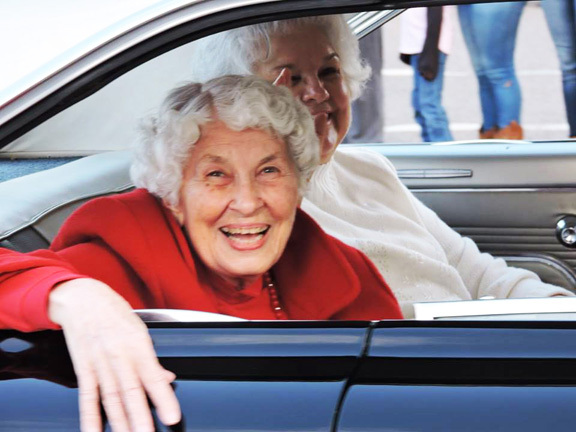 The parade will begin at 4:00 and at the conclusion of the parade everyone is welcomed to gather at the Courthouse Square for food, activities and to visit with Santa. The Polar Express movie will begin after dark. This will be an excellent opportunity to sponsor a popular chamber activity and reach out to the community during the holiday season. Sponsorship for this event is $100 and includes advertising on flyers, Saluda Chamber webpage, Facebook, and in the newspaper, and a vendor space at the movie night. Please respond by Thursday, Dec. 1 to be a part of this special offer. Call 864-445-4100 or email to reserve your prime spot.